As with any sizable Museum, a number of the items in the RTAF Museum were either not on display at the time of my visit, or were in a position where I could not photograph them. Nieuport - another really early machine. Model as yet unknown. Was stored outdoors on at least one occasion, and photographed at that time. Presumably now in safe storage once more. 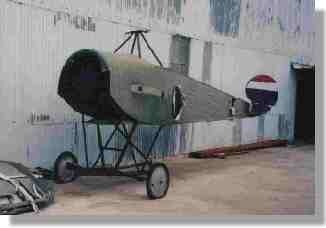 According to Steve Darke (www.thai-aviation.net ) it was not built to fly as the frame was made out of angle iron! Possibly it may have been a pattern frame for the Nieuports built locally, or may simply be a 'replica' for static exhibition. Grumman J4F Widgeon G44A- American light amphibian aircraft, coded '2494' at one time, c/n 1449. Possibly the only one of its type to see RTAF service. Stinson L-5B - WW2 version of the Stinson Voyager, ex USAF 44-16985. Service in Thailand during the 1950s and 1960s. Beech Bonanza - a light aircraft produced in a number of versions over many years. C/n D-1483. Possibly ex-service with the Thai Navy? Fairey Firefly Mk.1 - British single-engined carrier-based aircraft, c/n F.7402, ex British Fleet Air Arm MB410. Ten aircraft plus two Firefly T.2 trainers served from 1951 to 1959. Beechcraft C-45 - twin engined light transport, said to be ex USAF 44-87152 and civilianised as HS-TBE. About ten of these (including this one?) active with the RTAF 1951-early 1980s. de Havilland DH82A Tiger Moth - basic trainer, painted yellow (part this aircraft is visible in the T-6 photograph). One of 34 that served 1951-1971. Said to be G-AMGB, c/n 82794, at one time coded '21'. North American T-28D Trojan - two seat US Navy advanced trainer, replacement for the AT-6 Texan. 133 Trojans were active in Thailand from 1962 until 1991. Reported as ex USN Bu137661. Fairchild C-123 - twin engined medium transport ( it is behind the Douglas C-47 in that photograph), said to be RTAF555 construction number 20004. One of 50 supplied from 1960, active until 1998. North American F-86 Sabre - two of these early jet fighters, a F-86F (code 4322 and 5060) and a F-86L (coded 1215 and 30681). Over 60 Sabres were in use from 1958 until the late 1970s. Republic F-84G Thunderjet - coded 1231 and 878 (some sources quote '4314'). One of 31 aircraft in use from 1956 and in use until 1970. Helio U-10B - short take-off and landing observation aircraft, used in Thailand from 1961 until 1995. Reported serial 7135. Hiller UH-12B-4 - widely used light utility helicopter, c/n 597. In service from 1953.